If you’re anything like me, you too feel that one of the biggest reality show upsets of 2010 was when Ming Tsai got voted off The Next Iron Chef. 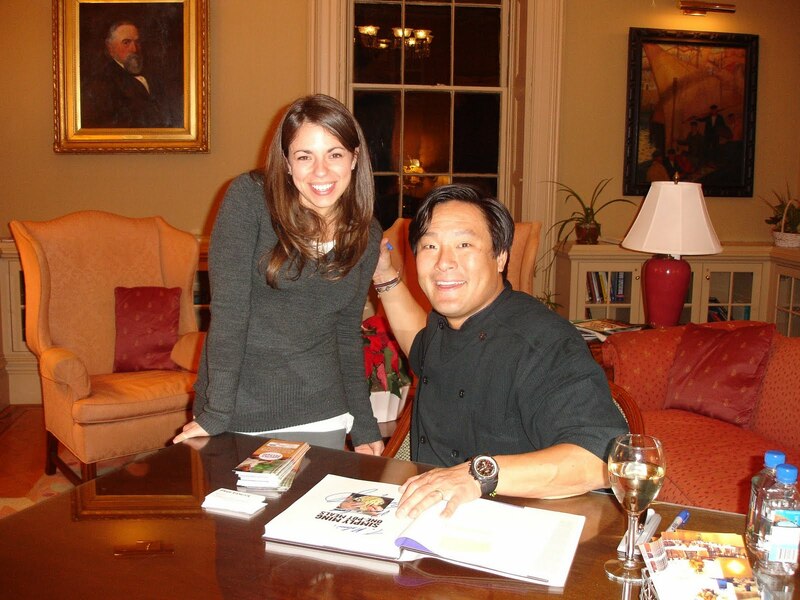 We don’t have many “celebrity chefs” here in New England, but luckily Ming Tsai is one of the select few. I’ve been watching Chef Tsai’s cooking show Simply Ming on our local PBS station for years, so as you can imagine, I was pretty starstruck when I finally got to meet him in person last month at his book signing and cooking demo at Brown University. He was just as warm, charismatic, and funny in person as he is on TV, and the experience reaffirmed my love for his cooking and philosophy on food. I left the demo on cloud nine with a signed copy of his newest book, Simply Ming One-Pot Meals , in hand. If you love Chinese food, but hate that way take-out makes you feel the minute you’re done eating it, then you’ll love this book. It’s filled with easy to follow, simple, and healthy Asian fusion recipes and lots of beautiful photography. Below is one of the recipes that Ming Tsai demoed at Brown-- it’s quick and easy and absolutely delicious! I initially had a bit of trouble finding the Korean chili flakes and fermented black beans used in the recipe, but finally came across them at Asiana in East Providence. If you live in the Providence, RI area, Asiana is a hidden gem and a terrific Asain grocery store to find all kinds of Chinese, Korean, and Thai ingredients. I substituted rigatoni for the orecchiette because I couldn’t find whole wheat orecchiette locally. Although, I must admit that Ming Tsai's original version with orecchiette, which I sampled at the cooking demo, was even more delicious. Cut the broccoli into florets. Peel the stems and slice into ¼ inch thick rounds. Bring a large pot of water to a boil. Season with salt. Boil the broccoli until cooked through but still crisp, just a minute or so. Using a slotted spoon remove the broccoli from the boiling water and submerge into a large bowl of ice water. Once fully cool, use the slotted spoon to transfer the broccoli to a plate, set aside. Now cook the pasta in the same pot of boiling water until just shy of al dente. Reserve about a cup of the pasta cooking water to use later in the recipe. Drain the pasta and set aside. In the same (now empty) pot, heat the extra virgin olive oil over a high flame. Add the garlic, fermented black beans, ginger, and onions, and sauté until the onions are soft. Add the white wine and allow the mixture to reduce by half. Add the ground pork and sauté, breaking up the meat until just cooked, about 10 minutes. 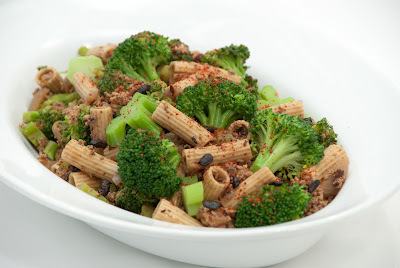 Add the broccoli and pasta to the pot and toss well. If the mixture seems too dry, add the reserved pasta cooking water. Add salt and black pepper to taste. Transfer to a large bowl and drizzle with additional extra virgin olive oil and sprinkle with the chili flakes. Enjoy!